OceanView’s Dining Services has launched its Culinary Academy, where residents learn to prepare creative dishes from our skilled chefs. The sessions are held in the historic Whipple Farmhouse, home of our Distinctive Dinning venue. Each class has a theme, and this month’s was maple, as it is the season for syrup making. The class started with a maple syrup tasting – one store-bought, and one our chefs made directly with sap tapped from trees on the OceanView campus! Residents said OceanView’s syrup had a more complex flavor. Chefs Jean and John then proceeded to demonstrate how to prepare Maple and Spice Mulled Wine, Maple Rosemary Glazed Walnuts, Savory Pain Perdue with Thyme Infused Maple Syrup, Strawberry Arugula Salad with Maple Balsamic Vinaigrette, and Candied Maple Bacon Ice Cream! After the cooking demonstrations were complete, everyone adjourned to one of the dining rooms for a luncheon with the foods prepared. As the food was enjoyed, residents discussed how excited they were to take the recipes back to their own kitchens to try. The theme ingredient for the next class is chocolate – which will include not only sweet, but also savory applications, as well as a sampling of fine Belgium chocolates that Chef Jean brought back from her recent trip overseas! Don’t miss our upcoming Entertaining Taste of OceanView Luncheon, where our chefs will demonstrate how to prepare some of their favorite brunch dishes, and attendees will get to sample them! Last Friday, our chefs went “ladle-to-ladle” for our annual Soup Challenge, where OceanView residents voted for their favorite. Last year’s winner, Chef Betsy, went on to also win the Peoples Choice Award at the Town of Falmouth’s Hot-in-a-Pot contest. This year’s contenders included: Chicken Tortilla, Wild Mushroom and Marsala, Grammy’s Ham and Noodle, Purple Cabbage with Horseradish and Rye, Chicken Cordon Bleu, and Shrimp and Hake Bouillabaisse. A hundred residents had the difficult task of sampling the savory soups and having to decide on just one to nominate as the best. The suggested $5 donation to participate benefits OceanView’s Resident Assistance Fund, a resident run non-profit organization that grants funds to residents in need. While people enjoyed freshly baked cookies and coffee, the votes were tallied. Chef Keegan (right) came in third with his Chicken Tortilla soup, Chef Johnny (left) received second place with his Wild Mushroom and Marsala, and Chef Betsy (center) took first place once again with her Chicken Cordon Bleu! OceanView residents certainly look forward to this popular event every year – especially knowing they will continue to enjoy our chefs’ delicious homemade soups all year round at one of our on-campus dining venues! Check out our Chef Specialty for one of our chef’s soup recipes! The new issue of our newsletter “OceanViews” is here! View previous editions on our Newsletters page and be sure to contact us to receive your own glossy copy in the mail. All this year, the Town of Falmouth is celebrating the 300th anniversary of its incorporation with a variety of special activities and events. The commemoration has also inspired a number of “legacy projects,” one of which is “The Story of Falmouth” Traveling Exhibit. View of Casco Bay from Falmouth, 1910. The first-ever exhibit to explore Falmouth’s unique story, twelve panels showcase the town’s rich history through rarely seen images and fascinating accounts of Falmouth residents. Beginning with the area’s first inhabitants 12,000 years ago and concluding in modern times, topics such as early settlement, recreation, governance, war, and education are examined. OceanView was honored to be selected as one of the stops on the exhibit’s tour schedule. All twelve panels will rotate between our independent living, assisted living and memory care buildings on campus, allowing all of our residents an opportunity to take a little trip back in time. To learn more about the Falmouth 300 calendar of events, the town’s history and where you can see The Story of Falmouth exhibit yourself, visit: falmouthme.org/falmouth-300 . Here at OceanView, we understand that people’s needs can change as they age. This is why our stress-free independent retirement living includes the future peace of mind of a care continuum with two assisted living residences – Falmouth House and Legacy Memory Care. Both offer priority access to our independent living residents, but are also options for those living outside our community. Left to right: Rita Dennis, Marketing Associate; Andrew Jones, Marketing Specialist; Gloria Walker, Director of Sales & Marketing; Tamera Vogel, Assisted Living Sales Consultant. New to these two residential communities is Tamera Vogel, Assisted Living Sales Consultant, who joined the OceanView Sales and Marketing Team this past December. Tamera brings to the position an impressive background in sales, long term care, and finances. With four levels of care, Falmouth House offers private apartments situated among beautifully appointed sitting areas, libraries, dining and activity rooms, with access to lovely gardens. Each individual is actively involved in their own personalized care plan. Supervised by licensed professional nurses 24-hours a day, the certified staff’s goal is to help the residents live life to the fullest, with daily assistance at their fingertips. Legacy Memory Care is a secure community for individuals with memory loss and dementia, implicitly designed to provide cues to guide residents to areas through the use of architecture and color. A private garden offers shaded patio seating, walking path and opportunities for gardening. The compassionate staff is specifically trained to deliver person-centered care, ensuring every resident enjoys meaningful life experiences and the feeling of success every day. At Falmouth’s Annual “Hot-in-A-Pot” Cookoff, OceanView once again won the People’s Choice Award! This year, it was Chef Betsy’s Roasted Red Pepper and Tomato with Smoked Gouda that delighted people’s tummies. The event was part of Very Merry Falmouth which kicked-off the Falmouth 300th Celebration. Held as a benefit for the Falmouth Food Pantry, attendees got to sample some of the best chili, chowder, soup, and stew in town. Betsy and one of our Servers, Heather, were busy dishing out cups of soup, with each serving getting garnished with a mini grilled cheese. Of course, the real winners are our residents who get to enjoy our chefs’ award-winning soups and other outstanding culinary creations daily at our various on-campus dining venues. The latest issue of the OceanViews Newsletter is HERE! Read it and previous versions on our Newsletters Page. Would you like to receive your own copy of our quaterly newsletter in the mail? Contact us to join our mailing list and stay informed of everything happening in the OceanView community! November is National Alzheimer’s Awareness month. With more than 5 million Americans currently living with the disease and someone in the US developing Alzheimer’s every 66 seconds, the need for funding for the support of treatment, care and research is critical. Held annually in more than 600 communities nationwide, the Alzheimer’s Association Walk to End Alzheimer’s® is the world’s largest event to raise awareness and funds for Alzheimer’s care, support and research. As part of this effort, Legacy Memory Care at OceanView held its 2nd annual walk on-campus to raise awareness and collect donations. Both residents and staff from our independent living, assisted living and memory care communities participated. OceanView’s Fitness Team created multiple routes across our 80-acre campus, utilizing wooded paths and sidewalks to provide walks of different lengths with various levels of terrain. Along the way, stations were set up with waters, apples and energy bars. Our fundraising total for the 2017 Walk to End Alzheimer’s® is currently at $7,500! All funds directly benefit the Alzheimer’s Association’s Maine Chapter. 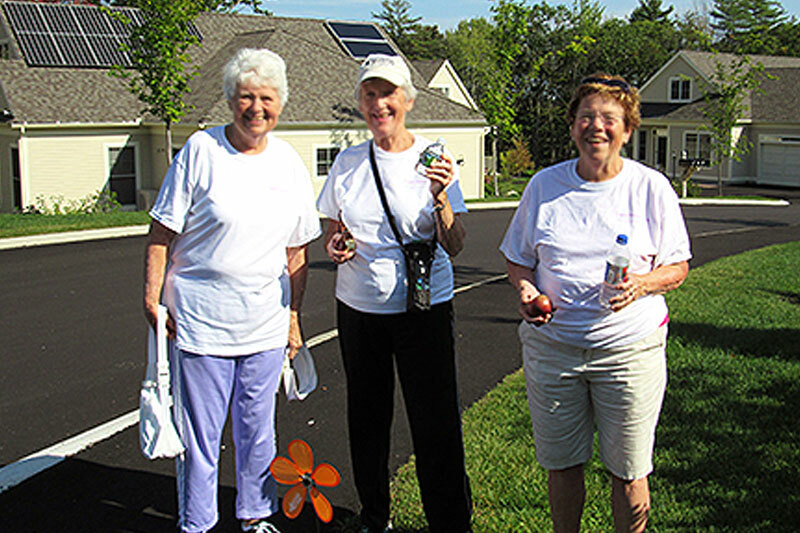 A huge thank you to our residents and staff for volunteering, spreading the word, walking, fundraising, and helping us all realize a world without Alzheimer’s! OceanView Celebrates 31 Years with an Evening Along the Nile! Last Friday OceanView celebrated its 31st anniversary with an Egyptian-themed bash! Our Blueberry Commons room was transformed into the “Valley of Kings” desert, complete with the Great Pyramids, Sphinx and King Tut’s sarcophagus. Residents, some of whom were in costume, enjoyed appetizers and drinks seated around tables decorated with stones, scarabs, grasses and reeds. Music group “Zapion” added to the exotic atmosphere with performances of Turkish, Arab, Iranian, Balkan, Greek and Armenian dance music. Residents then adjourned to the Main Dining Room where they were met by our waitstaff dressed in bright belted drapes, and golden head and neck pieces. The special dinner started with Roasted Carrot Soup and Hummus Plates. Entrees included Citrus Marinated Salmon over Tabbouleh, and Hazelnut Encrusted Chicken Breast over Eggplant Caponata. The dinner concluded with Egyptian Basbousa Cake (recipe below!) with Rose Petals and Macerated Strawberries, along with refreshing mint tea. And so we raise a glass in gratitude to the remarkable OceanView community of residents and staff for making these past 31 years truly unforgettable. Here’s to another memorable year!